Hurrah! My projects which were cut out and waiting to be made are finished! This is from a German pattern from 1935. It came from one of those wacky pattern magazines, which I have a bizarre attachment to- the ones that look like crazy maps and you have to trace them out. The mannequin has more of a “torso” than I do, so the gaping doesn’t happen on me in real life. 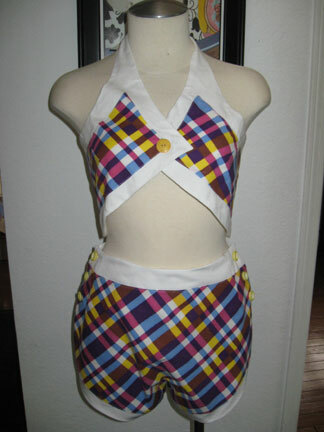 The plaid fabric is original from the 30s. Now I’m set for a summer beach party, even if it does look somewhat juvenille, that was the style! >It’s incredible how you just whip out perfection after perfection! I’m always impressed! 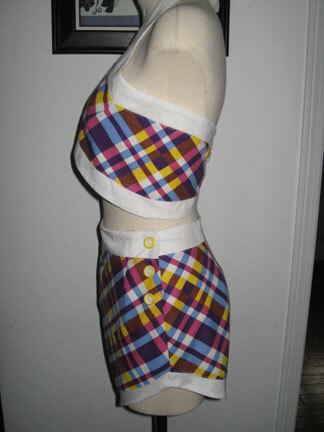 >Great idea to use a plaid — it’s so cute on the bias! >Not juvenile at all, it’s wonderful! So can you actually swim in this? >Wow, now that’s amazing. (And great job matching up the stripes at the sides!) Can’t believe you don’t mind tracing off magazine patterns- it drives me to distraction…. >I love the plaid!!! I can totally see you sporting this with a jaunty 1930s sunhat and pair of brightly colored sandals and chic sunglasses! The bikini styles from the 30s and 40s are my favorite. ;) I'd love to make one eventually! >this is beautiful! 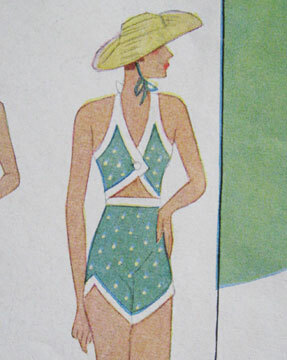 i've been looking for a 1930s bikini pattern. hmm…must try to get my hands one some of these german patterns. love your blog, btw!